The Federal Reserve’s three waves of Quantitative Easing since 2008 show how easy it is to create free money. Yet this has been provided only to the largest banks, not to strapped homeowners or industry. Ben Bernanke’s helicopter only flies over Wall Street to drop its money. An immediate $2 trillion in “cash for trash” took the form of the Fed creating new bank-reserve credit in exchange for mortgage-backed securities valued far above market prices. QE2 provided another $800 billion in 2011-12. The banks used this injection of credit for interest rate arbitrage and exchange rate speculation on the currencies of Brazil, Australia and other high-interest-rate economies. So nearly all the Fed’s new money went abroad rather than being lent out for investment or employment at home. U.S. Government debt was run up mainly to re-inflate prices for packaged bank mortgages, and hence real estate prices. Instead of alleviating private-sector debt by writing down mortgages in line with the homeowners’ ability to pay, the Federal Reserve and Treasury created money to support property prices – to push the banking system’s balance sheets back above negative net worth. The Fed’s QE3 program in 2012-13 created money to buy mortgage-backed securities each month, to provide banks with money to lend to new property buyers. For the economy at large, the debts were left in place. Yet commentators focused only on government debt. In a double standard, they accused budget deficits of inflating wages and consumer prices, yet the explicit aim of quantitative easing was to support asset prices. Inflating asset prices on credit is deemed to be good for the economy, despite loading it down with debt. But public spending into the “real” economy, raising employment levels and sustaining consumer spending, is deemed bad – except when this is financed by personal borrowing from the banks. So in each case, increasing bank profits is the standard by which fiscal policy is to be judged! The result is a policy asymmetry that is opposite from what most epochs have deemed fair or helpful to economic growth. Bankers and bondholders insist that the public sector borrow from them, blocking the government’s power to self-finance its operations – with one glaring exception. That exception occurs when the banks themselves need free money creation. The Fed provided nearly free credit to the banks under QE2, and Chairman Ben Bernanke promised to continue this policy until such time as the unemployment rate drops to 6.5%. The pretense is that low interest rates spur employment, but the most pressing aim is to provide easy credit to revive borrowing and bid asset prices back up. The main financial problem with funding war occurs after the return to normalcy, when creditors press for budget surpluses to roll back the public debt that has been run up. This imposes fiscal austerity, reducing wages and commodity prices relative to the debts that are owed. Consumer spending shrinks and prices decline as governments spend less, while higher taxes withdraw revenue. This is what is occurring in today’s financial war, much as it has in past military postwar returns to peace. Governments have the power to resist this deflationary policy. Like commercial banks, they can create money on their computer keyboards. Indeed, since 2008 the government has created debt to support the Finance, Insurance and Real Estate (FIRE) sector more than the “real” production and consumption economy. In contrast to public spending for goods and services (or social programs that increase market demand), most of the bank credit that led to the 2008 financial collapse was created to finance the purchase property already in place, stocks and bonds already issued, or companies already in existence. The effect has been to load down the economy with mortgages, bonds and bank debt whose carrying charges eat into spending on current output. The $13 trillion bank subsidy since 2008 (to enable banks to earn their way out of negative equity) brings us back to the question of why taxes should be levied on the 99% to pre-save for Social Security and Medicare, but not for the bank bailout. Current tax policy encourages financial and rent extraction that has become the major economic problem of our epoch. Industrial productivity continues to rise, but debt is growing even more inexorably. Instead of fueling economic growth, this of credit/debt threatens to absorb the economic surplus, plunging the economy into austerity, debt deflation and negative equity. So despite the fact that the financial system is broken, it has gained control over public policy to sustain and even obtain tax favoritism for a dysfunctional overgrowth of bank credit. Unlike the progress of science and technology, this debt is not part of nature. It is a social construct. The financial sector has politicized it by pressing to privatize economic rent rather than collect it as the tax base. This financialization of rent-extracting opportunities does not reflect a natural or inevitable evolution of “the market.” It is a capture of market structures and fiscal policy. Bank lobbyists have campaigned to shift the economic arena to the political sphere of lawmaking and tax policy, with side battlegrounds in the mass media and universities to capture the hearts and minds of voters to believe that the quickest and most efficient way to build up wealth is by bank credit and debt leverage. Public debts everywhere are growing, as taxes only cover part of public spending. The least costly way to finance this expenditure is to issue money – the paper currency and coins we carry in our pockets. Holders of this currency technically are creditors to the government – and to society, which accepts this money in payment. Yet despite being nominally a form of public debt, this money serves as public capital inasmuch as it is not normally expected to be repaid. This government money does not bear interest, and may be thought of as “equity capital” or “equity money,” and hence part of the economy’s net worth. The federal government has achieved fiscal balance (even surpluses) in just seven periods since 1776, bringing in enough revenue to cover all of its spending during 1817-21, 1823-36, 1852-57, 1867-73, 1880-93, 1920-30 and 1998-2001. We have also experienced six depressions. They began in 1819, 1837, 1857, 1873, 1893 and 1929. Do you see the correlation? The one exception to this pattern occurred in the late 1990s and early 2000s, when the dot-com and housing bubbles fueled a consumption binge that delayed the harmful effects of the Clinton surpluses until the Great Recession of 2007-09. When taxpayers pay more to the government than the economy receives in public spending, the effect is like paying banks more than they provide in new credit. The debt volume is reduced (increasing the reported savings rate). The resulting austerity is favorable to the financial sector but harmful to the rest of the economy. Most people think of money as a pure asset (like a coin or a $10 dollar bill), not as being simultaneously a public debt. But to an accountant, a balance sheet always balances: Assets = Liabilities + Net Worth. This liability-side ambivalence is confusing to most people. It takes some time to think in terms of offsetting assets and liabilities as mirror images of each other. Much as cosmologists assume that the universe is symmetrical – with positively charged matter having an anti-matter counterpart somewhere at the other end – so accountants view the money in our pocket as being created by the government’s deficit spending. Holders of the Federal Reserve’s paper currency technically can redeem it, but they will simply get paid in other denominations of the same currency. The word “redeem” comes from settling debts. This was the purpose for which money first came into being. Governments redeem money by accepting it for tax payment. In addition to issuing paper currency, the Federal Reserve injects money into the economy by writing checks electronically. The recipients (usually banks selling Treasury bonds or, more recently, packages of mortgage loans) gain a deposit at the central bank. This is the kind of deposit that was created by the above-mentioned $13 trillion in new debt that the government turned over to Wall Street after the September 2008 crisis. The price impact was felt in financial asset markets, not in prices for goods and services or labor’s wages. This Federal Reserve and Treasury credit was not counted as part of the government’s operating deficit. Yet it increased public debt, without being spent on “real” GDP. The banks used this money mainly to gamble on foreign exchange and interest-rate arbitrage as noted above, to buy smaller banks (helping make themselves Too Big To Fail), and to keep paying their managers high salaries and bonuses. This monetization of debt shows how different government budgets are from family budgets. Individuals must save to pay for retirement or other spending. They cannot print their own money, or tax others. But governments do not need to “save” (or tax) to pay for their spending. Their ability to create money means that they do not need to save in advance to pay for wars, Social Security or other needs. There are two kinds of markets: hiring labor to produce goods and services in the “real” economy, and transactions in financial assets and property claims in the FIRE sector. Governments can run budget deficits by financing either of these two spheres. Since President Franklin Roosevelt’s WPA programs in the 1930s, along with his public infrastructure investment in roads, dams and other construction – and military arms spending after World War II broke out – “Keynesian” spending on goods and services has been used to hire labor or pay for social programs. This pumps money into the economy via the GDP-type transactions that appear in the National Income and Product Accounts. It is not inflationary when unemployment exists. However, the debt that characterized the Paulson-Geithner bailout of Wall Street was created not to spend on goods and services, but to buy (or take liability for) mortgages and bank loans, insurance default bets and arbitrage gambles. The aim was to subsidize financial losses while keeping the debt overhead in place, so that banks and other financial institutions could “earn their way” out of negative net worth, at the economy’s expense. The idea was that they could start lending again to prevent real estate prices from falling further, saving them from having to write down their debt claims to bring levels back down within the ability to be paid. Why tax the economy at all? And why financial and tax reform should go together. Taxes pay for the cost of government by withdrawing income from the parties being taxed. From Adam Smith through John Stuart Mill to the Progressive Era, general agreement emerged that the most appropriate taxes should not fall on labor, capital or on sales of basic consumer needs. Such taxes raise the break-even cost of employing labor. In today’s world, FICA wage withholding for Social Security raises the price that employers must pay their work force to maintain living standards and buy the products they produce. However, these economists singled out one kind of tax that does not increase prices: taxes on the land’s rental value, natural resource rents and monopoly rents. These payments for rent-extraction rights are not a return to “factors of production,” but are privatized levy reflecting privileges that have no ongoing cost of production. They are rentier rake-offs. Land is the economy’s largest asset. A site’s rental value is set by market conditions – what people pay for being able to live in a good location. People pay more to live in prestigious and convenient neighborhoods. They pay more if there is local investment in roads and public transportation, and if there are parks, museums and cultural centers nearby, or nice shopping districts. People also pay more as the economy grows more prosperous, because one of the first things they desire is status, and in today’s world this is defined largely by where one lives. Landlords do not create this site value. But speculators may ride the wave by buying property on credit, as long as the rate of land-price gain exceeds the interest rate. This “capital” gain is the proverbial free lunch. It is created by public investment, by the general level of prosperity, and by the terms on which banks extend credit. In a nutshell, a property is worth whatever a bank will lend, because that is the price that new buyers will be able to pay for it. This logic was more familiar to the public a century ago than it is today. A property tax to collect this “free lunch” rent is paid out of the rent. This leaves less to be capitalized into new interest-bearing loans – while freeing the government from having to tax labor and industrial capital. So this tax not only is “less bad” than others; it is actively desirable to reduce the debt overhead. Rent levels are not affected, but the government collects the rent instead of the property owner or, at one remove, the mortgage banker who turns this rent into a flow of interest by advancing the purchase price of rent-yielding properties to new buyers. Real estate was the major source of rising net worth and wealth for America’s middle class for over sixty years, from the return to peace in 1945 until the 2008 financial collapse. Rising property prices were fueled largely by banks providing mortgage credit on easier terms. But by 2008 these terms had reached their limit. Interest rates were seemingly as low as they could go. So were down payments (zero down payment) and amortization rates (zero, with interest-only loans) and property values were becoming fictitious as a result of a tidal wave of fraud by the banking system’s property appraisers, while the income statements of borrowers also was becoming fictitious (“liars’ loans,” with the main liars being the mortgage writers). If the rise in real estate prices (mainly site values) had been taxed, there would have been no financial overgrowth, because this price-gain would have been collected as the tax base. The government would not have needed to tax labor either via income tax, FICA wage withholding or consumer sales. And taken in conjunction with the government’s money-creating power, there would have been little need for public debt to grow. Taxing rent extraction privileges thus would minimize debt levels and taxes on the 99%. The next leading form of economic rent is taken by oil, gas and mining companies from the mineral deposits created by nature, as well as by owners or leasers of forests and other natural resources. Classical economics from David Ricardo onward defined such income received by landlords, mining companies, forestry and fisheries as “economic rent.” It is not profit on capital investment, because nature has provided the resource, not human labor or expenditure on capital – except for tangible capital investment in the buildings erected on the land, saws to cut down trees, earth-moving equipment to do the mining, and so forth. The basic contrast is between a productive industrial economy and a rent-extracting one in which special privileges, monopoly pricing and economic rents divert spending away from tangible capital investment and real output. Classical economists defined economic rent generically as “empty” pricing in excess of technologically necessary costs of production. This would include payments to pharmaceutical companies, health management organizations (HMOs) and monopolies above their necessary cost of doing business. Much like paying debt service, such economic rent siphons market revenue away from tangible production and consumption. It was to demonstrate this that Francois Quesnay developed the first national income statistics, the Tableau Économique. His aim was to show that the landed aristocracy’s rental rake-offs should form the basis for taxation rather than the excise taxes that were burdening industry and making it uncompetitive. But for the past hundred years, commercial banks have opposed property taxes, because taxing the land’s rent would mean less left over to pay interest. Some 80 percent of bank loans are for real estate, mainly to capitalize the rental value left untaxed. A property and wealth tax would reduce this market – along with the government’s need to borrow, and hence to pay interest to bondholders. And without a fiscal squeeze there would have been less of an opportunity for the financial sector to push to privatize what remains of the public domain. Today’s central financial problem is that the banking system lends mainly for rent extraction opportunities rather than for tangible capital investment and economic growth to raise living standards. To maximize rent, it has lobbied to untax land and natural resources. At issue in today’s tax and financial crisis is thus whether the world is going to have an economy based on progressive industrial democracy or a financialized and polarizing rent-extracting society. Stephanie Kelton, “The ‘Fiscal Cliff’ Hoax,” http://www.latimes.com/news/opinion/commentary/la-oe-kelton-fiscal-cliff-economy-20121221,0,2129176.story, December 21, 2012. 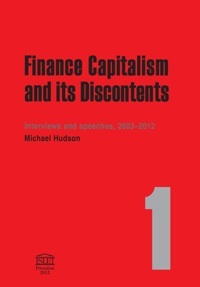 Michael’s latest book, Finance Capitalism and its Discontents is now available. This entry was posted in Michael Hudson and tagged austerity, fiscal cliff. Bookmark the permalink. Despite the breadth of the learned Dr. Hudson’s store of political and socio-economic knowledge, I don’t think he gets the monetary-economic science at all. Given that the balance sheet balances “assets” and “liabilities”, and given that the “liabilities” side of the sheet includes both “debt” and “equities”, or net worth as explained by Dr. Hudson, there is no reason why debt-free issuances of real money by Treasury do not occupy the “equity” portion of the liabilities side of the “balance sheet” of the national economy. FYI, this is exactly where those coins the of Treasury non-debt issuance end up. Unfortunately, those FR currency-bills are printed, but not “issued”, by the Treasury. They are issued into monetary-economic circulation AS A DEBT by the Federal Reserve banks. Until that point, FR currency-bills are no different from when banks issued their own notes. They could print up Billions and have them in the vault. But until someone signed up for one of them, they have only the value of the paper they’re written upon. The key here is what is implied by ‘nominally’. It (governmnet printed money) is said to be NOT a debt – not something owed nor in need of paying back. So, how does it get to be “nominally” a debt? Is it like a little pregnant? If, IN FACT, the government ‘issued’ those currency notes, rather than merely printing them, then he hits the nail on the head – part of the national economy’s net worth. However, the far greater significance, left unsaid, is the power of the government (Treasury) to just issue the nation’s MONEY, and not just the currency Bills. This can also be done without issuing any debt, just as was done with the Greenbacks. The needed conversation about what is money, and what is debt, and why we err in accepting that money-must-be-debt because we accept the double-entry bookkeeping structure for national accounts is at the door. Once done, comprehensive solutions to the problems Dr. Hudson correctly imparts to the oligarchic purveyors of debt will become eminently solvable. A universal and equal bailout of the POPULATION (including non-debtors since the banks have cheated them too) with new fiat would fix EVERYONE including the banks from the bottom up, at least in nominal terms. And if combined with at least a temporary ban on credit creation and metered appropiatly, no one would be hurt in real terms either. Amazon appears to be *sold out* of MH’s newest book. And, on one level, this is kinda great. But for those of us who didn’t get a copy, may we hope that there is a Kindle version in the pipeline? In order to stop rentier extraction, the Gov (state or federal) could open a mortgage bank and offer qualified loans at the same rate as the LIBOR rate, thus robbing banks of their mortgage revenue stream. I’m sure there are lots of side effects I haven’t thought of but all the ones I came up with I think are either desirable or solvable. The Building Societies in the UK used to offer loans to home buyers at variable rates of interest, which worked quite well unless the interest rates became out of hand. Usually a person would need a 10% down payment on a house and verification of income from his employer. The maximum loan amount was determined by approximately 2.5 times annual income if my memory serves me correctly. The building societies were bought up by the big banks. The problem here is that banks now have somewhat of a monopoly on lending and are rather reluctant to make loans to the public, since they now make most of their profits by speculating on the international stock, bond, currency and commodity markets. Perhaps it is time that banking was required to serve the public interest again.